The second nor'easter in seven days has moved out, but a third lurks. Over half a million people are still without power across the Northeast just before midnight Thursday as the region digs out from its second nor'easter in seven days. 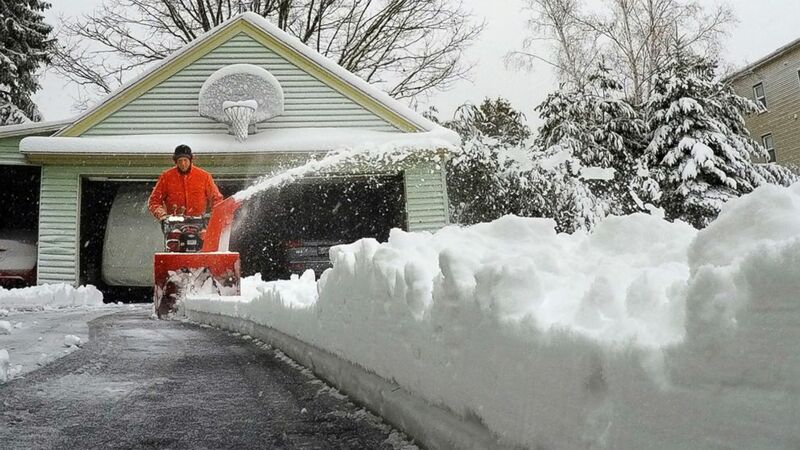 Two to three feet of snow fell from New Jersey to New England as the major nor'easter swept across the Northeast on Wednesday and brought heavy snow to parts of northern New England on Thursday. But even before the snow turns to slush a third nor'easter may hit by Monday. (Charles Krupa/AP) John Visco clears snow from around the cars in his driveway in Derry, N.H., March 8, 2018. (Frank Becerra Jr./The Journal News via USA Today Network) Croton Falls firefighters assist an injured driver after his truck went off of Route 121 at Route 116 in North Salem, N.Y., March 7, 2018. (Robert F. Bukaty/AP) A Portland, Maine resident uses a snowblower to clear snow during a nor'easter, March 8, 2018. (Jessica Hill/Journal Inquirer via AP) A tree branch fallen from the weight of heavy snow lies on top of a fire truck in East Hartford, Conn., March 8, 2018. 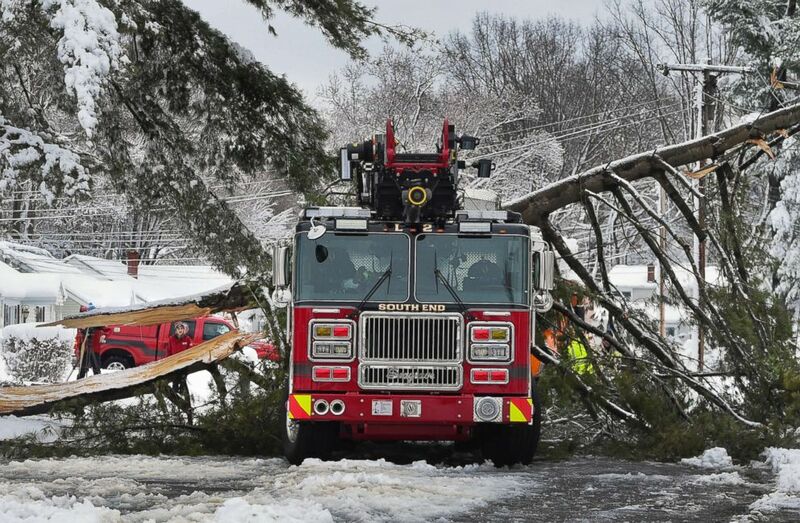 The branch that fell took down live power lines and landed onto the truck as it was parked responding to a fire. No one was injured. (Steven Senne/AP) Brian Farrell, of Walpole, Mass., enters his home, March 8, 2018, after a tree fell on the house and a car, right, in Walpole, Mass. At least one person died from the storm. 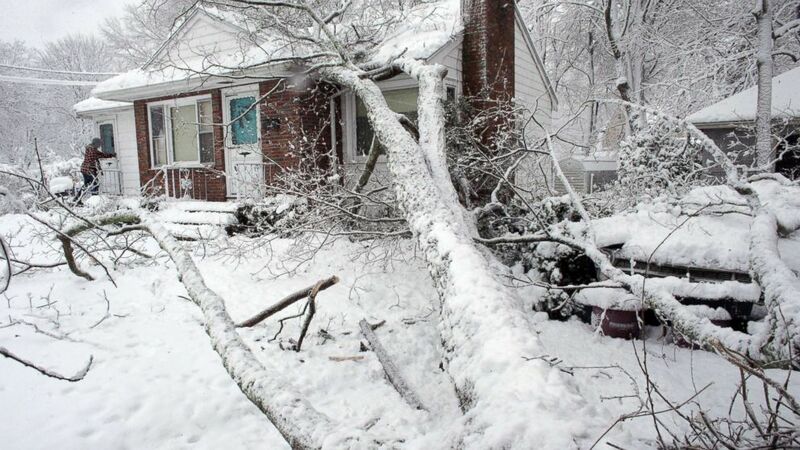 The victim, an 88-year-old woman from Suffern, New York, died after being hit by a falling tree in her driveway, according to police in Suffern, which is about 30 miles northwest of Manhattan. 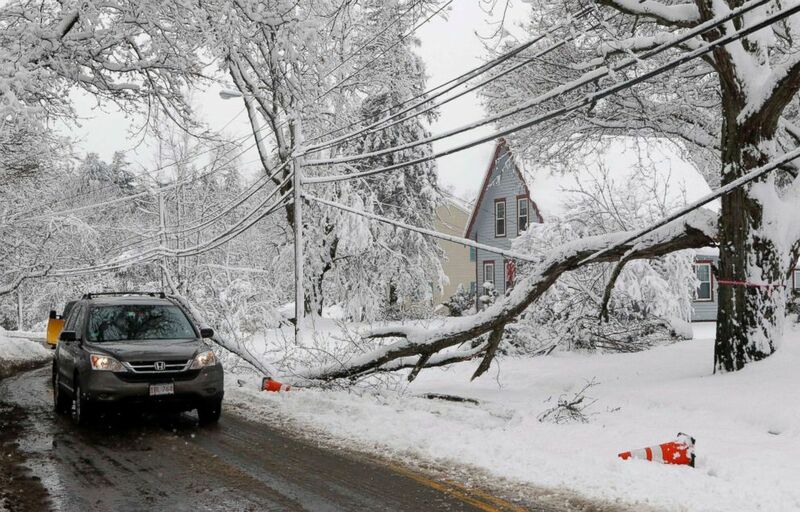 As of 11:40 p.m. on Thursday over 530,000 customers were without power in the Northeast. That number was down about 400,000 customers from earlier in the day Thursday, though. New Jersey had restored power to 50,000 customers and Massachusetts brought power back on line to 70,000 customers during Thursday evening. 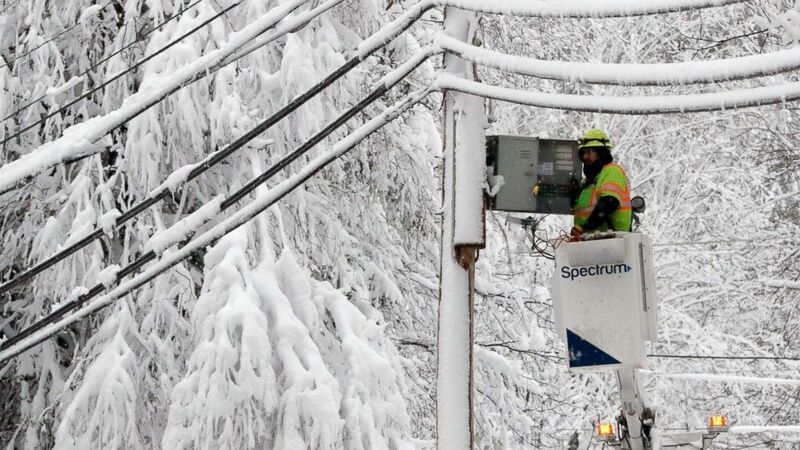 (Bill Sikes/AP) A lineman works to restore power amid limbs sagging with heavy wet snow after a snowstorm, March 8, 2018, in Northborough, Mass. The weather also had a big impact on travel: More than 3,200 flights were canceled because of this storm. 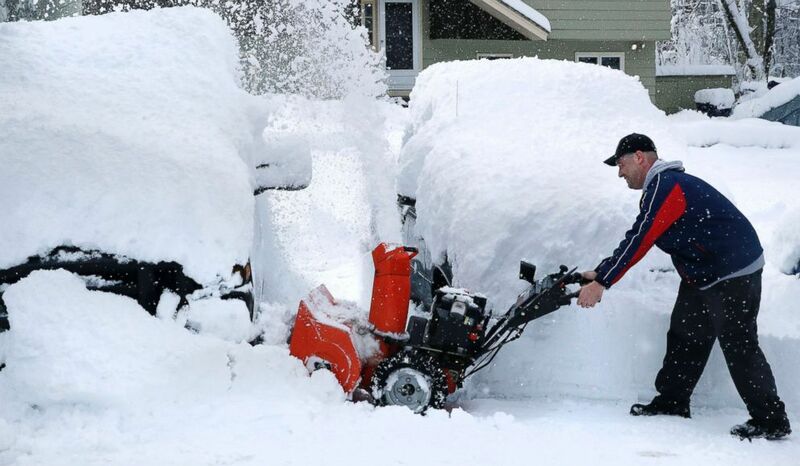 In northern New England Thursday, Woodford, Vermont, hit the 3 foot mark, picking up 36 inches of snow. 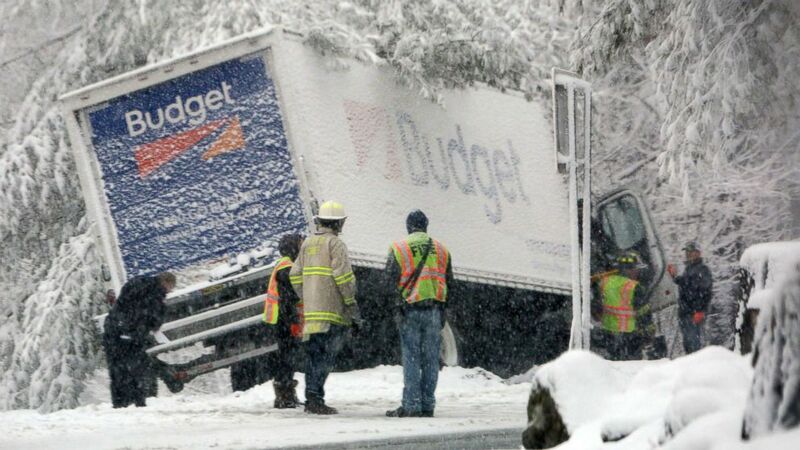 On Wednesday it was areas inland of the major cities that saw the heaviest snow. The cities themselves were mostly spared: Philadelphia saw about 6 inches, New York City saw 3 to 4 inches and Boston saw 6.4 inches. A possible third nor’easter could impact the hard-hit Northeast by Monday. Two long-range forecast models, the European and American, are not in agreement about the storm's path. (Bill Sikes/AP) A motorist navigates around a downed limb partially blocking a road and resting on a power line after a snowstorm, March 8, 2018, in Northborough, Mass. 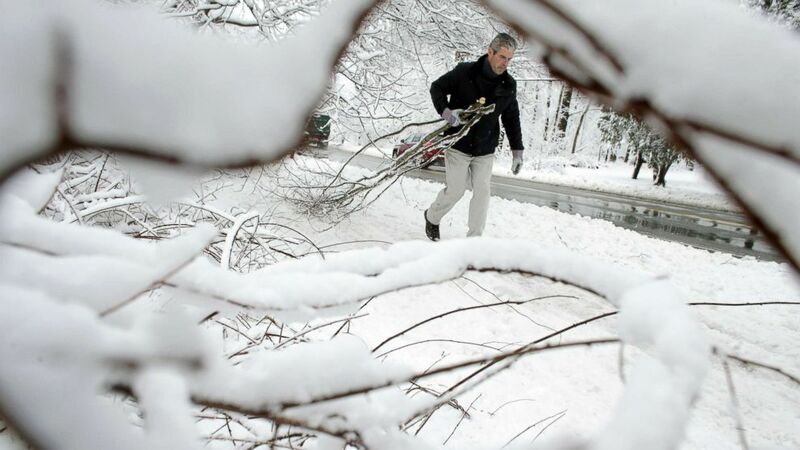 (Steven Senne/AP) Kevin Crowley, of Weyland, Mass., works to remove damaged tree branches from a driveway, March 8, 2018, in Sherborn, Mass. The European model shows a very weak system that heads straight out to sea, with no impacts at all to the Northeast. However, the American model shows the storm moving much closer, potentially bringing another nor’easter near the coast. It is still too early to determine which path the storm could take. 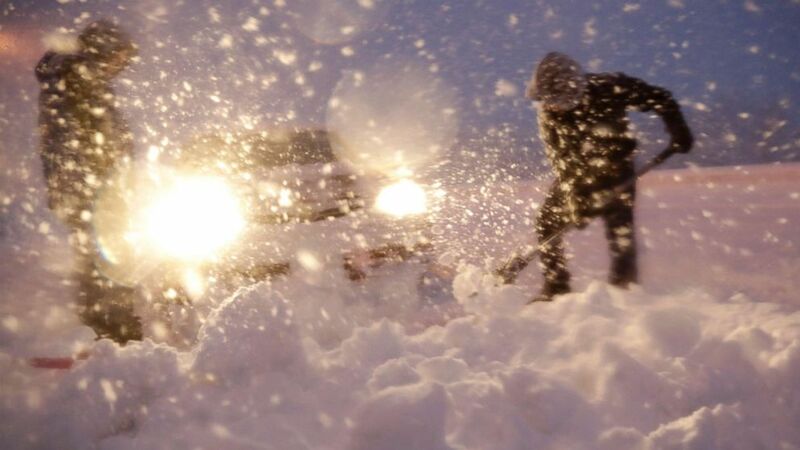 (Julio Cortez/AP) Men shovel snow while trying to free a vehicle stuck on a snowbank along Route 23 during a snowstorm, March 7, 2018, in Wayne, N.J.
ABC News' Alexandra Faul, Dominick Proto, Brendan Rand and Daniel Steinberger contributed to this report.